For those doing business in Korea or wanting to do business in Korea, it helps to have an understanding of the local antitrust laws and regulations. 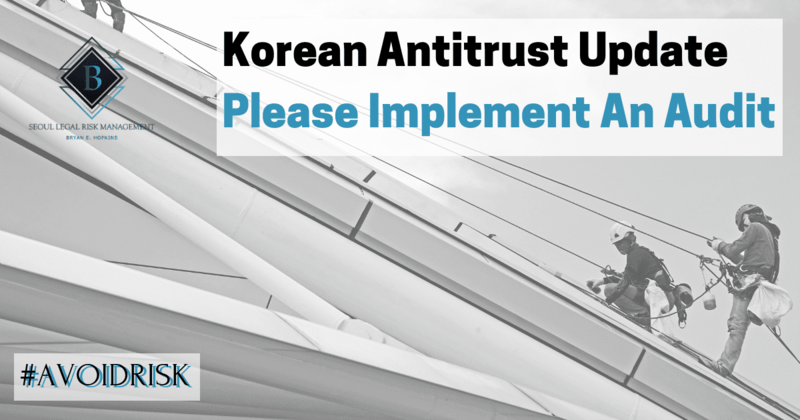 To begin with, the Korean antitrust regime is governed by the Monopoly Regulations and Fair Trade Act (MRFTA) of 1981. Like in the US and other jurisdictions, the MRFTA‘s goal is to promote free and fair competition. Currently, the MRFTA is used as a tool to curb the monopolistic behavior of Korean multinationals (Chaebols) and to help accelerate good corporate governance. Currently, Korea is using the MRFTA to help establish a “level playing field” for businesses. Prevention of certain abusive acts by prohibiting acts that (i) unreasonably control the sale of commodities and services; (ii) interfere with the business activities of others; (iii) unreasonably alter prices; and (iv) substantially lessen or restrict competition. Currently, the KFTC is planning to take strong initiatives in order to strengthen its enforcement capacity under the MRFTA. It plans on increasing its regulations concerning cartels, review of supplier-distributorship issues, abuse of dominance penalties, and review of superior bargaining issues and concerns. Therefore, it is recommended that companies conduct a more thorough antitrust compliance audit. More sanctions and exposure to derivative actions. I will be blogging more about this in the future.